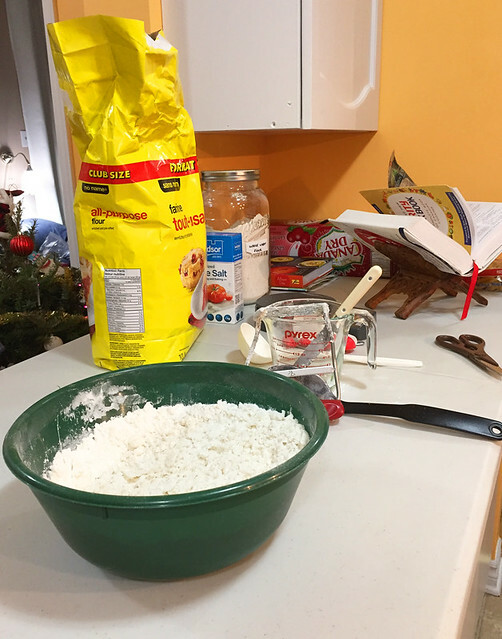 The last few days before Christmas were a flurry of cooking activity. On the 22nd, I baked tortière, pumpkin pie, chocolate pumpkin brownies (this time without the coffee), while my husband made bread machine corn bread. On the 23rd I made my first attempt at German stollen, banana nut muffins, and the ill-fated pumpkin pie; my husband baked corn meal muffins. Of course, we cooked dinner both days as well. 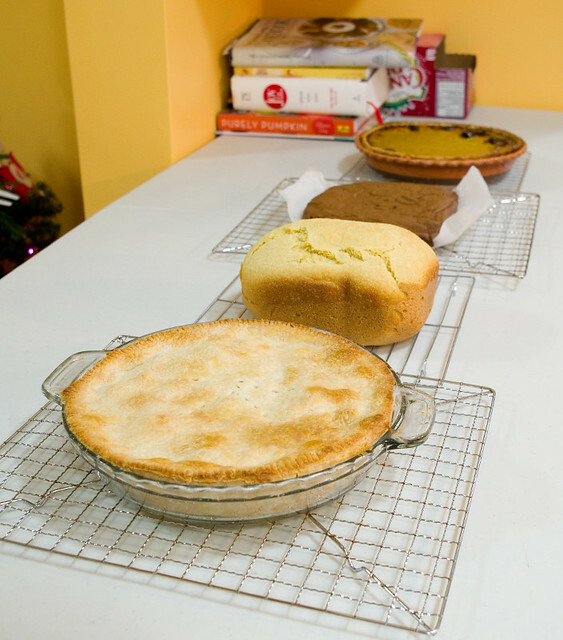 Tortière, corn bread, chocolate pumpkin brownies, and pumpkin pie. Then, on the 24th, I made Nan’s pan rolls, rosemary bread in the breadmaker, and deviled eggs. I’d planned to make orange-glazed carrots & parsnips, but we forgot to buy carrots and there was no way I was facing the stores on Christmas Eve, so that got written out. 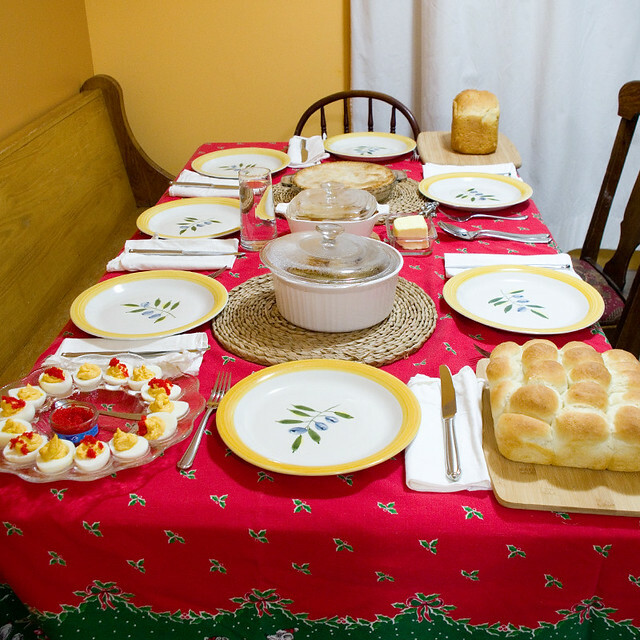 Then we hosted Christmas Eve dinner for our little family, plus my in-laws and my brother-in-law. Usually this dinner is hosted by my husband’s parents, but they are currently between homes, having sold their house in October but with their new condo not being complete until the start of February. So this year it was up to us to make this family tradition happen. This dinner is traditionally consists of (and no one can tell me why) cabbage rolls, which my mother-in-law made this year, and tortière, which I made. I also added the pan rolls, rosemary bread, and deviled eggs with lumpfish caviar. I tried to honour my mother-in-law’s German heritage by also serving stollen, for which I used the Taste of Home Almond-Filled Stollen recipe and The Spruce’s Easy Almond Paste recipe, since I couldn’t find almond paste in any of the local shops. Sadly, the dish went down like a lead balloon. I mean, I overbaked one loaf (the recipe makes three), but I didn’t serve that one. Even so, only two slices were even eaten with or after Christmas Eve dinner. The bread rose nicely and had a good texture, although I can’t be much of a judge of the flavour because I don’t really like candied fruits (I don’t like fruitcake either for that very same reason). I think I’ll just forego making this bread next year if we host this dinner again. It was a lot of work and nobody seemed to like it. Maybe I’ll just make gingerbread instead; at least that I’ll eat if nobody else does! Posted on December 29, 2017 December 29, 2017 by owntwohandsblogPosted in Cooking, HolidaysTagged baking, celebration, Christmas, christmas eve, dinner, family, german, germany, holiday, Holidays, hosting, supper, tradition, traditions, winter.